I am SMITTEN with Prima's "Tales of You and Me" collection! This is a piece of wall decor I made using this fantastic feminine, vintage, PERFECT line! I started out by painting a square Prima wooden tray set from the Relics and Artifacts line by Sandra Evertson. I used gesso, the vintage rose acrylic paint, tea stain mist, and some purple chalk ink. Once dry, I cut paper from the 6X6 paper pad to fit in the squares, distressed them, gave them a light white wash of gesso, inked the edges with more purple chalk ink (Dewdrops brand in eggplant) and glued them inside before adhering the trays together. The saying is a piece of Dusty Attic Chipboard. I primed it with gesso, then used a couple of different Shimmerz purple sprays, then dry brushed with gesso again for a muted look. I added the Prima lamp post and a bronze corner that I think I bought at Michaels. :) I added coordinating flowers and some flower trim. This is a close up of the flowers I used in the middle of that cluster. I cut up the "Tales" vine and then added them to the trays, leaving room to fill up the middle with various colors, again from the tales collection, and adding some flower trim in various spots and finishing it off with brushing on some gesso to soften the look. I adhering the smallest tray to the top of the other two for a more dimensional piece. 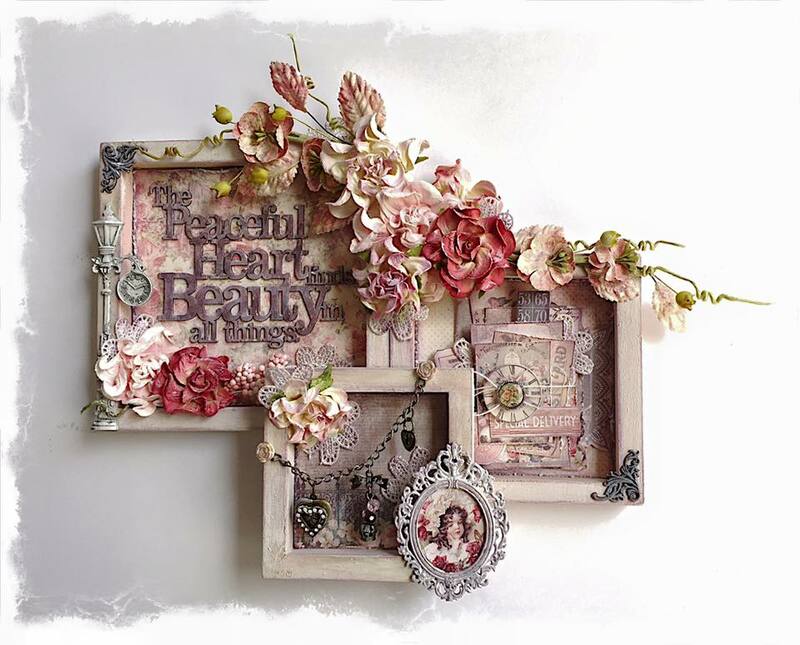 I cut out the image in the frame from the 6X6 paper, and added it to this Tim Holtz frame. I painted it with gesso and added the purple chalk ink again. Then I hung a chain, using the rosette brads from the Tales collection to make it look like they were holding the chain, but I just glued them on. The trinkets are all from Prima. The little heart lock twisted in the wind when I was taking the picture, but that is from the Tales ephemera pack. I added the flower and lace trim to coordinate with the rest of the flowers. I cut up some elements from the Tales paper and used some ephemera pieces as well for this layered pile of paper. I distressed the edges, whitewashed each piece, then arranged them in a layered manner, adding foam dots to bulk it up. I tied some of them with cord, tucked some flower trim in between the layers and added a brad in the middle of the clock die cut.